How a Disk Works! A disc basically functions to move the soil and flip the soil over and mix it from top to bottom and side to side. Depending on the soil, speed, and pulling power, mixing can occur quite well with one pass, but many times takes more than one pass. If the soil can be plowed or chiseled prior to discing, this will help loosen the soil. If there is little or no, live or dead vegetation, this is also helpful. Incorporating heavy vegetation like dead corn stalks can be a challenge. The efficiency of mixing the soil can be increased if the field is disced perpendicular to the initial pass. If incorporating chemicals or fertilizers, a double pass can make the incorporation deeper and more uniform. Always follow label instructions when using agricultural chemicals. When the soil is mixed, it allows air to enter the soil and for vegetation to be covered with soil. When trying to control weeds, live weeds are many times killed by either the exposure to air or are smothered under the soil. On the flip side, a new crop of weed seeds is brought to the soil surface. Some discs have adjustable gangs. A gang is the row of disc blades which can be from just 2-3, like the disc pictured, or many many more. Our disc has adjustable gangs. Both the front and rear gangs can be adjusted, or not adjusted, individually. This allows the operator more control over how the soil is moved. When purchasing a disc this is a nice feature to have and allows the disc to be able to do more tasks. It also costs more money. You may have to go to another manufacturer or dealer to find an adjustable disc. An example of this is that our disc can be adjusted so that it will rip deeply into the soil or it can be adjusted so that it hardly digs at all, and used very similarly to a cultipacker. With this option we only purchased one piece of equipment insead of two. 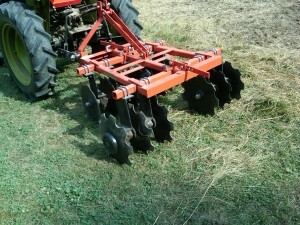 Using a Disc for Soil Preparation. 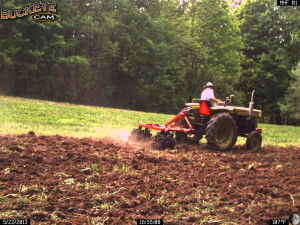 On our farm, we do not own a plow for soil preparation. Due to our way of clearing land, by cutting trees very close to the ground and leaving the stumps, it would not be practical to use a plow anyway. Once the trees are cleared, we spray any vegetation with glyphosate to kill it. When the vegetation is dead and preferably dry, we use the disc to till the soil, going slowly over the stumps. Initially this land is used for whitetail deer food plots and is planted with either annual brassicas or annual sweet oats. Because fields initially need to have their perennial weed populations controlled, annual crops are grown for the first year or two. To help accomplish this, glyphosate is used in between spring and fall annual cropping. Once the perennial weeds are controlled, we start planting perennial crops of Whitetail Institute, Whitetail Clover, Clover and Chicory and or Clover, Chicory and Sanfoin. After growing the perennial crops for 3 to 5 years and some of the stumps start to decompose, we can start to plant row crops like corn. In between each crop, we use glyphosate and the disc to control the weeds and prepare the seedbed for planting. One caution about using this practice is that a hardpan will develop about 4-6 inches down in the soil due to the repeated pressure of the disc. If you have the ability to chisel plow or moldboard plow every few years, this will help with internal soil drainage.